News organization staff are future-minded, at least when it comes to the very near-term. But few are thinking about the longer-term future of news in the coming age of AI, automation and voice-based computing. While staff do track emerging technology and trends in the very near term, few are thinking about the farther future of journalism. And almost no one is actively building long-term scenarios for the intersection of news, technology and democracy. A new survey published by the Future Today Institute asked people who work within the news media ecosystem how they think about the future. 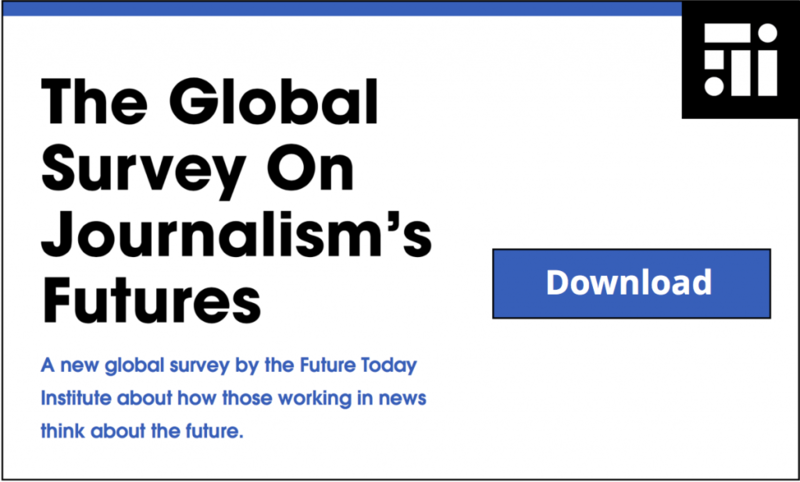 In this first-of-its-kind global survey, participants were asked pointed questions about what strategies and tactics are being used to plan for the next 12 months - 20 years of journalism. Survey participants represented a wide range of professionals: CEOs and publishers, managing editors, chief technology officers and product managers, financial analysts, strategy officers, human resource specialists, reporters, editors and on-air news anchors. Participants hailed from Europe, Asia and Southeast Asia, Latin America and throughout the United States and Canada. A similar set of questions were fielded to the general population in partnership with Ipsos, a global market research and consulting firm. Key Finding: News organization staff between the ages of 44-64 are more likely to be “nowists”––that is, they think about the immediate future (12 months ahead) and the near-future (1 - 5 years) more than other timeframes. The nowists––those who are 44-64 years old––tend to be those managers who are making strategic and operational decisions that directly affect their companies as well as the future sustainability of news. News organization staff are future-minded, at least when it comes to the very near-term. Some 75% of participants say that their newsrooms pay attention to tech trends. 63% say that their newsrooms engage in tech trends analysis at least once a quarter. In contrast, only 18% of the general population say their companies are tracking and analyzing trends. Staff are optimistic about the possibilities for the near-term future (12 months - 5 years) of news. However, only 49% of those surveyed say that their news organization’s leadership is likely to address their near-term fears. Participants cited a lack of resources, management bottlenecks, and limited time when it comes to longer-term strategic foresight and planning. Thinking beyond 5 years is more rare: 28% of participants say they rarely think about the next 5-10 years of their newsrooms. Fewer news organizations are tracking the mid-term impact of tech trends (5 - 10 years) on news. 69% say that their newsrooms aren’t conducting analysis on emerging tech trends and how they will impact news in the next 5 - 10 years. Longer-term scenario mapping for the future of news is also rare: The majority of news organizations participating in this survey do not research emerging trends and how they will impact the news business 5 - 20+ years from today. Only 17% of news organizations engage in longer-term scenario mapping. Very few staff are thinking about the longer-term future of news in the coming age of AI, automation and voice-based computing: 53% say they rarely think about the next 10 - 20 years of journalism. 78% say that they never engage in any longer-term planning and scenario mapping for the future of news. Our research also shows that even across geographic boundaries, there is a clear correlation between age and futures thinking. Staff who are at the beginning and end of their careers are more likely to think about the mid-future and farther-future (5 - 20+ years) of news. Meanwhile, staff between the ages of 44-64 are more likely to think only about the immediate future (12 months ahead) and the near-future (1 - 5 years). The survey revealed just how far into the future news organizations are planning, and it uncovered the fears and hopes embedded in today’s newsrooms. Journalists are deeply concerned that they won’t be prepared for new communication technologies, that the business models at their organizations won’t be relevant much longer, and that they could face technological unemployment, like many other white-collar workers. For more information or to arrange an interview, please contact hello@futuretodayinstitute.com or call 267-342-4300.